to detect violations in the course of pregnancy, etc..
embryonic - is to identify the date of conception, that is, the moment of meeting the egg with the sperm. As known, egg is released on average 14 day cycle is called ovulation. In this way, for the calculation of the duration of pregnancy is required to conduct a report on the day of ovulation. If we compare this method with the average cycle, the method consists in embryonic weaning 2 weeks from obstetric method. It should be taken into account, that 70% women's ovulation cycle - different, more 28 days. If the menstrual cycle is longer, then ovulation begins later 14 day. In such a case, and conception occurs later. From the day of the last menstrual period should take longer 14 days. It is therefore important to know the, when she was ovulating. online payments -Online calculators can accurately calculate the gestational age. When, when sexual acts are rare, possibly, that she herself remembers, when there was fertilization of the egg. Determine the day you can in the case, If a woman regularly at monthly measures the basal temperature, well guided by the charts. Date should be reported to the gynecologist. It should be taken into account, the doctor often refers to the period of pregnancy, which is greater than the reality on the 2 of the week. This is because the, that doctors use the term obstetric. It depends on the first day of the month. Based on this methodology, we can conclude, that pregnancy begins with the first day of the menstrual cycle. In spite of this, calendar method is quite accurate. Given the same method gynecologists calculated date upcoming birth. To do this, the first day of the last menstrual period is added 280 days or taken away 3 month and added 7 days. With knowledge of the exact ovulation day is added to the first day of menstruation 264 instead of the day 280. This method allows you to find out, not only how to count the period of pregnancy, but also a day of birth. Over the years, this technique is used as a diagnosis of fetal development. With ultrasound you can specify gestational age. Considered more accurate data, obtained in research in the early weeks of pregnancy, ie until 8 weeks. During this period, healthy embryos develop equally. Therefore, taking into account the gestational age of the fetus size can be calculated accurately. However, the more time - the more errors. This is because the, the fruit every day starts to show individuality. For minor deviations on 7 days or less, gynecologists do not take this into account. Tentative dates are calculated based on the measurement data of the coccyx-parietal size. The result obtained using medical special table. 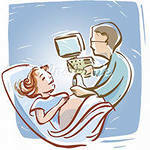 Many women visit a gynecologist in the early days of a delay monthly to identify, pregnant or not. However, it is impossible to find. Uterus and increases slightly before the menstrual cycle. As for the growth of the uterus due to pregnancy, these changes begin with the end of the first trimester of pregnancy. AT 5-6 weeks uterine size reaches the egg, and 8 weeks of its parameters reach Kushina egg. AT 10 weeks - female fist. therefore, get an accurate answer to the question, how to calculate the gestational age, by using this technique, only the first term of the period. Each expectant mother must remember the day the first stirring toddler. Typically, such changes in a woman's body goes through to the 20th week of pregnancy and the first to 18 week - during the second case. This date is entered in the card pregnant and taken into account in determining the date of birth. However, the terms of the first stirring of the baby does not always coincide with the date indicated in the map. Do not neglect this afternoon. Otherwise perenashivanie baby can cause his death. must be considered, the first stirring of the lungs, but quite tangible. Evaluate the development of the fetus is possible from the second trimester of pregnancy, taking into account the length of the uterus. It can be measure with a tape. To do this, the pregnant woman should lie on the couch. With each week added approximately 1 centimeter. Another method is the measurement table, which is used by all gynecologists. on 40 week - before the birth the uterus descends to the level 32 weeks. This is due to the promotion of the child's head in the lower pelvis. In addition, gynecologists figures take into account the volume of their stomachs. However, it is not always possible to find out exactly, how to calculate the gestational age. Stomach volume may be measured with the navel. When a normal weight before and during pregnancy stomach volume to 32 Time is about 85 cm, the end of pregnancy, the figure was 90-100 cm. This is explained by the rapid set of baby weight. The length of the uterus also allows time to identify various pathologies, for example, oligohydramnios or polyhydramnios. This method allows you to find out, how to calculate the gestational age. It is held during the first weeks. However, the result is not always accurate. Take a blood test is necessary from a vein. This technique is used for the calculation is usually not the pregnancy, and for early diagnosis of the current pregnancy, including the detection of various pathologies.